I review books that revolve around 3 key aspects to live The Good Life: Health, Wealth and Social. They are more like takeaway points that you can quickly ease into your life. Some good and some bad. Nonetheless, they are part of our life. 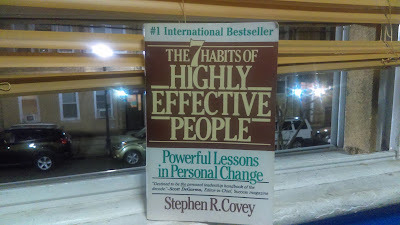 Stephen Covey defines habits as revolving around knowledge, skill, and desire. Knowledge is the what and why. Skill is the how. And desire is the motivation. So you can see why when it comes to setting goals and reaching our vision, habits have a tremendous gravity pull. They can work with us or against us. Here is one habit often overlooked by many but something we should be cognizant of: our ability to change our mindset from a negative to a positive one. Naturally, our negative thoughts outweigh our positive ones. I'm sure you experienced it at some point or another. At work, when one of your employees or co-workers drops the ball by costing the company a sale or making you stay a bit longer. Even if it's just one time, that one time usually overrides any positives demonstrated in the past. This even happens in relationships too where your partner might do one stupid thing negating any positives which can cause the relationship to spiral downwards. The point here is to overcome negative thoughts with positive ones. Sounds simple right? It is, but nobody works on it. I'm going to narrow my focus on goals. You and I can relate. There have been plenty of times we set goals, but failed to achieve them. For some, we never even start! Don't worry. It happens. The key is to see why and learn how to adapt. One thing you can do is make your goals smaller rather than larger. Instead of working out for 2hrs per day why not start out with 20 minutes first. Doing so allows you to be more consistent and avoid the feeling of failure. When you set these outrageous out of reach goals you're setting yourself up for failure. And you're brain will act accordingly. It will do anything to avoid that pain. However, small goals are more easier to achieve and allows you to be more consistent. Likewise, your brain chemically rewards you. Once you get rewarded, you keep doing it. How do you know if your goals are too big? If you're goals are too big you are more likely to procrastinate. Lets say you want to start up a business. Your first goal is to acquire a $100,000. Lets also say you never raised that much money before. Guess what? Majority of us will keep putting off that daunting task because it's too big. Start out small. Raise $10,000 or even $1,000 before going that high. You have to earn the right. I’m guilty of it too! I never really enjoyed reading a few years ago. It was completely boring to me. I noticed almost every successful person reads so I said to myself I better get to it. However, when I started I tried to read 1 book a day. That lasted about half a week... Eventually I adapted and the first thing I did in the morning was read for 15 minutes. That was it. It kept me consistent and over time, I read more and longer. So be careful with procrastination. It's usually a sign indicating something. When it comes to habits, make them concise and easier. What is one habit that you are currently working on? Should You Stop Following Your Passion? Click here to get Tony Robbins' Ultimate Relationship Program!